One of challenging yet fun things about a motor home is deciding where to put all the Stuff. Our Navion is smaller than a “small house” and we lived in our former View for six months, so arranging things is an important task in order to maintain space and sanity. We try to follow some guidelines when arranging things. It might appear that these are self-evident, but some gear is too fragile or too large, so creativity is a must. Items we use frequently should be close at hand. Everything coffee and tea is kept together by the kitchen sink, for example. Items used together should be stored together. We keep all the canine items in the storage areas over the driver. Things should be organized to minimize set-up and take-down routines. We no longer carry with us the bed extension cushion as it’s been used so little and is unstable when in place. Items that are used outside should be stored outside. An exception is the slow cooker (above), which has its own box in the rear external storage area. After many trips we found an outside place for the X-pen, which is heavy and had been riding between the twin beds. A hitch mounted cargo carrier has its advantages! 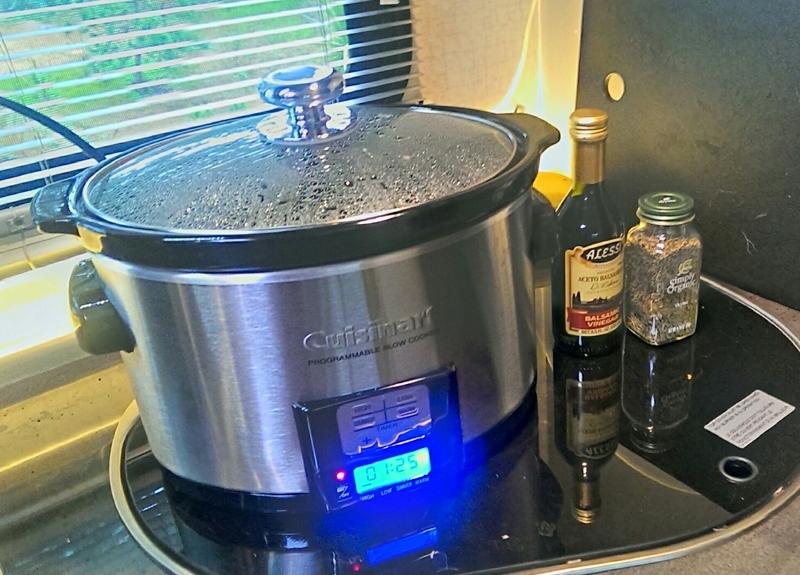 This entry was posted in 2016 Maritime Walkabout, RV, Travel and tagged NAVION, SLOW COOKER, STORAGE, VIEW by Landon Kimbrough. Bookmark the permalink.